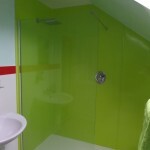 Protective Wall Cladding - Perfect for Student Accommodation! This entry was posted on April 2nd, 2014 by IPSL. Many landlords operate in the student sector because students make great tenants. Students are happy to pay rent well in advance and void periods are few, which is better for cash flow. Unfortunately, on the downside, unlike other tenants such as families and professionals, student tenants are less likely to take care of a property. They tend not to keep the place very clean, so anything you can do to help protect your properties from everyday wear and tear will help you to avoid unnecessary bills further down the line. So how useful is wall cladding? Student kitchens are often the stuff of your worst nightmares. The average student doesn’t think too much about wiping down surfaces and washing up the dishes. Instead they ignore the pile of dirty pots and unidentifiable bacterial organisms festering on work surfaces until the whole place is a health hazard. If you opt for hygienic wall cladding instead of traditional tiled splashbacks, cleaning up becomes a whole lot easier. Wall cladding is easy to wipe down and unlike painted walls, you can throw a whole bottle of bleach at it with no fear of leaving a nasty mark. Bathrooms are high moisture areas. When showers and baths are used multiple times per day, they soon begin to show the signs of wear and tear. Leaks, damp and mildew can very quickly leave a student bathroom interior looking like something in a Petri dish: grey and furry with nasty black blotches here and there. However, if you use hygienic wall cladding to protect your student bathrooms, they will stay watertight and mould free for as long as you have student tenants in residence. The thing with students is that they often bring their bicycles into hallways and bedrooms in order to keep them safe from thieves. They are also prone to inviting lots of friends around and holding impromptu parties, which can leave hallways and entrance vestibules looking a bit worse for wear after a few months. Wall cladding can be used to protect the walls in areas of high traffic, or any rooms where the walls could do with a bit of extra protection. It may seem counter intuitive to spend money keeping a student property in good condition. After all, students are likely not to care for the place, so why bother? But this is a foolhardy approach. As a landlord you are expected to keep your properties in good condition, and if you want to attract new (and better quality) student tenants, it pays to have attractive, well-maintained properties on your books. It is also a good idea to protect your investment so you can minimise the cost of restoring it to optimum condition when the time comes to sell. Tenants never look after a home as if it was their own, so everything you can do to protect your investment will benefit you in the long run. Installing plastic wall cladding will be an up-front expense, but remember, as a legitimate business expense, it will also be tax deductible.